Anyone who knows this beauty chick knows her favorite scent of all time is Ralph Lauren Romance. And with good reason -- its aroma is truly timeless. Maybe my affinity for Ralph Lauren clothing has something to do with it -- after all, the brands in the Polo family take up a considerable amount of space in my closet. But it's more than that! 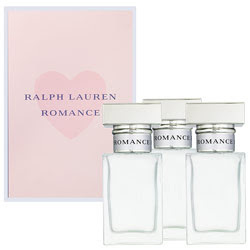 No matter which fragrance I try, I always find myself coming back to the one, the only, Ralph Lauren Romance. Perhaps it's the notes of sungoddess rose and marigold. Maybe it's the yellow freesia, white violet and lotus flower. Or perchance it's the chamomile oil, day lily. It could even be the patchouli, oakmoss and musk that add just that little touch of woodsy flavor. But now I've surely died and gone to heaven with the Romance Purse Spray Trio Set. That's right -- three absolutely adorably sized bottles, each at a non-hefty .5 oz. (each of which is sure to last, oh, a month with the amount I spray on myself each day! ).